The cease and desist order was issued Aug. 24, after residents complained of a noxious odor in building common areas and in their apartments, which they claimed caused symptoms including nausea, vomiting and fainting. WASHINGTON — Gas fumes persist inside a luxury apartment building near Nationals Park in Southeast even after the city lifted a stop-work order imposed at a neighboring property. The cease and desist order was issued Aug. 24, after residents complained of a noxious odor in building common areas and in their apartments, which they claimed caused symptoms including nausea, vomiting and fainting. The order was lifted Sept. 4. “Post [stop] work order lift, my wife felt dizzy and vomited,” resident Patrick Coleman said. “Personally, I have felt light headed and had some mild nausea,” and he said neighbors complained of migraines, throat problems and asthma aggravation. 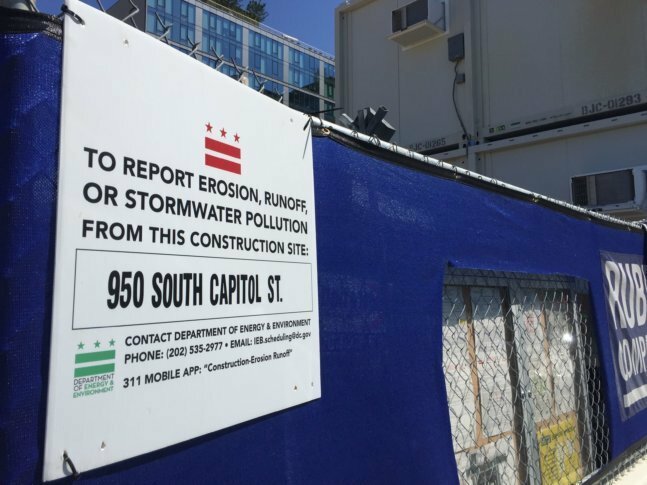 The work at 950 South Capitol St. Southeast was placed on hold by D.C.’s Department of Energy and the Environment (DOEE) for the removal of an underground gas storage tank and tainted soil from an old gas station. The property is right next to the air intake system for One Hill South Apartments, located at 28 K St. in Southeast. Property managers gave residents electronic air purifiers and charcoal filters for air vents and offered a one-month credit on rent. Even so, Coleman describes his apartment and the building’s hallways, lobby, common areas and parking garage as smelling like a gas station — one he could no longer live in. A letter sent to residents claims the air quality does not pose a risk to residents’ health. “…Our monitoring plan has confirmed that the air quality readings coming from construction activities are well below DOEE-approved standards,” the One Hill South Management Team told WTOP in a statement. But Coleman says residents still are worried about the potential long-term effects of extended exposure. “It’s shocking to me that the D.C. government would accept a private contractor’s word for what was safe and accept their word for the level of exposure that people are experiencing,” Coleman said. DOEE has not responded to WTOP’s requests for comment. Previously, DOEE said work could not continue until the construction company submitted an odor control plan to city inspectors who would oversee its implementation. Coleman and his wife believe they’re lucky. Their lease just expired; they could move away. But they’re still concerned about remaining residents. The excavation work is expected to wrap up by the end of October.